4 No's.Rieter carding machines, with Aero U chutes, with 24"coiler with can changer, in excellent running. Suitable for carding of artificial fiber. The fiber is carded fully so that the cotton mesh becomes, ore even through double-cylinder carding at high speed. 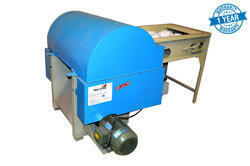 The cotton feeding roller is controlled by frequency conversion with anti-metal protection device.